This 3 part series beginning with MTG247, covers the rare Wudang stick fighting method using a short stick somewhat like the Arnis type of stick. Only one stick is used and is aimed at an edged weapon such as a knife attack. 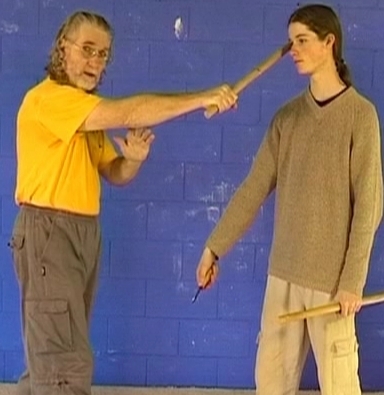 There are 12 training drills covering every conceivable type of knife attack using the stick to defend against it. Your partner also uses a stick as we strike his stick which represents his forearm or wrist. 4 of the twelve drills will be taught on each of the 3 volumes. Possibly the easiest of all weapons to use is the short stick as you can usually get one from somewhere. The drills begin simple and continue with ever increasing complicated and longer drills until the twelve are finished. On this volume one, the first four methods are taught.